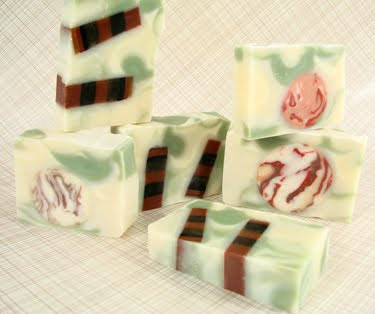 Want to learn how to make this soap?This recipe is featured in September’s monthly newsletter. Don’t miss another free tutorial. Sign up now!What? You missed this one? And you really really want it? Email us at [email protected] and we’ll forward you a copy. Next Post: Soap Queen TV Special Edition! Soap Loft Creations- The melt and pour was a couple of months old. Could you use pieces of cold process in place or melt and pour ? What would be the advantage of using melt and pour in place of cold process ? WOW! WOW! WOW! I cannot wait to learn how you did this! How long did you age the MP for? I'll be curious to hear how consistently these dissolve when used. They look amazing! It's CP and melt and pour, yes. I aged the MP so that it was ultra hard before embedding. Love it!! is this mp and cp?